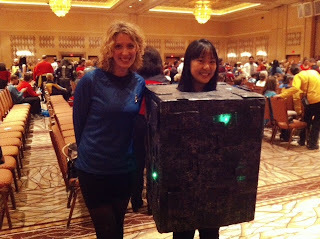 One of the main reasons I attended the Star Trek Las Vegas Convention was to participate in the World Record Attempt for "Most Star Trek Costumes In One Room." It seemed a crazy thing to do. I get all nervous and jittery around crowds. Tight spaces and loud noises make me a little passey-outey. People in general typically make me kind of itchy. But, I wanted to do it. 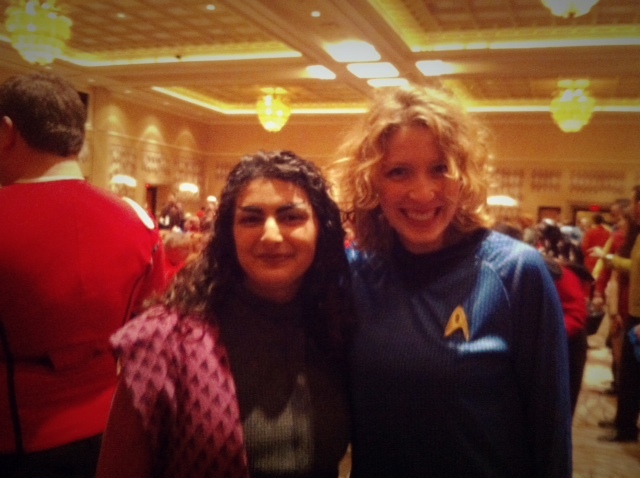 I wanted to put myself in a room packed to the gills with Trekkies and see what happened. 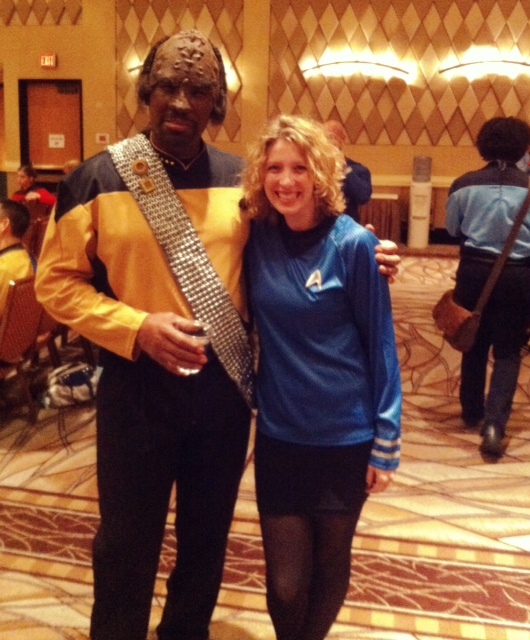 Basically, I wanted to be able to tell you a story of the time I helped break a Star Trek-themed world record. 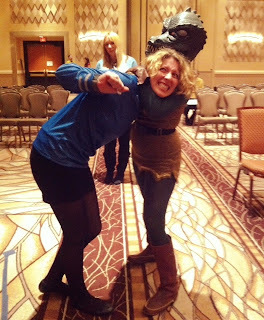 We needed to beat the London record of 1063 costumed fans and we had about two hours to congregate in the room. After standing in line for half an hour with a few hundred other Trekkies, my outfit was deemed worthy by a Star Trek Canon Inspector and I was given number 499 as I entered a large ballroom. Right after, a voice came over the PA system to announce that there were 500 people in the room. Cheers went up. I walked around taking pictures and chatting with other fans for about an hour and a half. This is not something I'm typically ok with. I can talk to other humans--I just don't like to. I have a tendency to either seem aloof and uninterested or I talk about my weirdo obsessions for a million years until the other person wants to run away. This didn't seem to be a problem in the world record room. Everyone there had the same obsession that I did. They were all obsessed enough to put on a costume and stand around in a crowded room for two hours waiting to break a record just because they were fans of the same thing that I am. Approaching the girl dressed as a Borg cube or the Worf guy or the chick in the killer Enterprise uniform was instantly easy. Me- Hey, I love your costume! You look great! Me- Can I take your picture and put it on my blog? I had variations of this conversation about fifteen times in that two hour span. They were the easiest cold conversations I've ever had in my life and they inevitably always moved into common Trek topics: favorite series, favorite captain, favorite series finale, favorite episode, how can I get my kids into Trek, how much time did you spend on your costume, where'd you get those awesome boots? As the 1064th person entered the room a sea of red, gold and blue cheered. Klingons let loose with battle cries. Two Gorns celebrated with some Jem'Hadar and a few Ferengi and some Vulcans went ahead and grinned. We stayed a while longer. Terry Farrell entered in a red dress to become the 1085th costumed fan. We had to wait around for ten minutes to officially hold the record but it wasn't a chore--even for me. Actually, it was awesome and eye-opening. Walking around amongst over a thousand costumed fans made Star Trek come to life for me in a totally different way. It was like walking through some kind of actual Federation convention (complete with time travelers and friendly Borg) where everyone was just happy to be there, together, in celebration of our common obsession. I think that is such a great experience! How cool that you were able to do it. I get a little twitchy around crowds, too, but in my experiences, it has almost always turned out to be okay. I'm glad you had fun!